You quickly realise in any staff team that it’s the people you work with who can really make the project what it is. This is true of our wonderful Khmer teacher Sao Vanna. Sao Vanna is no ordinary teacher. This 47 year old mother was born and raised in Prasat Chas village where her workplace, Helping Hands’ [Iqbal] school, is based. As an active member of the community, Sao Vanna has been by our side from Step 1 in initiating Helping Hands, organising land and helping with signing of those all-important documents on the NGO’s behalf ten years ago. Even being heavily-pregnant with one of her sons at the time didn’t stop her! Now Sao Vanna’s energy is shared with our youngest learners on a daily basis. As a teacher she leads full classes through the basics of the Khmer language, a notoriously challenging language and script to master! Many of these students may face a disrupted education and be unable to attend or complete government school. Sao Vanna’s classes ensure that they are fluent in their native Khmer from a young age, ensuring brighter opportunities for them in the future. As an elder in the village, Sao Vanna’s ability to read and write is somewhat unique. The village where Helping Hands is based has very high rates of adult illiteracy and innumeracy due to limited government schooling during and after Cambodia’s tragic civil war. Sao Vanna’s passion for education from an early age meant that she volunteered in various community groups and continually gained as much education from as wide a source as possible. Her enthusiasm and determination now marks her out as a respected community member, representing both Prasat Chas village and Helping Hands during various meetings. 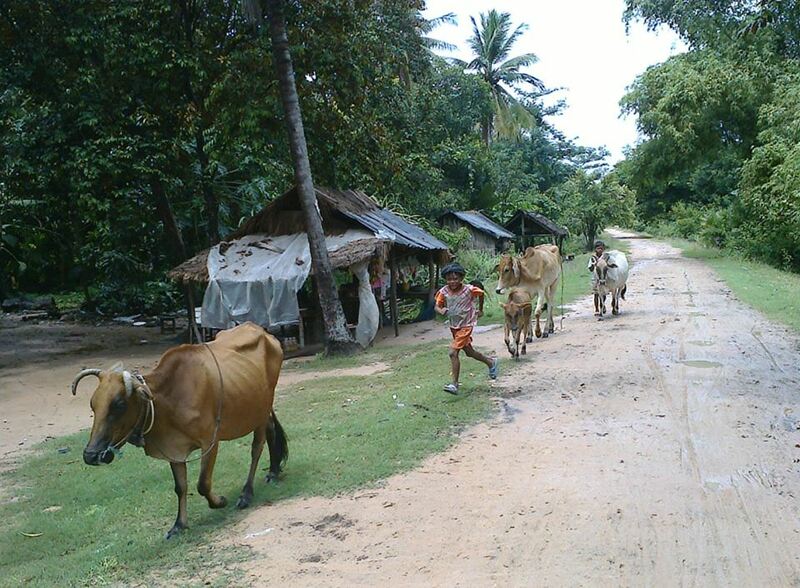 A typical scene in Prasat Chas village. Discussing life in the village, Sao Vanna lists the challenges and changes that she has lived through. From drought to disease, poverty to unemployment, Prasat Chas residents have faced tough times, even by Cambodian standards. The resilience and strength of the community, with active engagement in any way possible to improve the situation, is in no small part thanks to Sao Vanna and her strong, maternal leadership. Come and find Sao Vanna teaching our daily kindergarten classes to read, write (and sing!) in their native Khmer at Helping Hands. 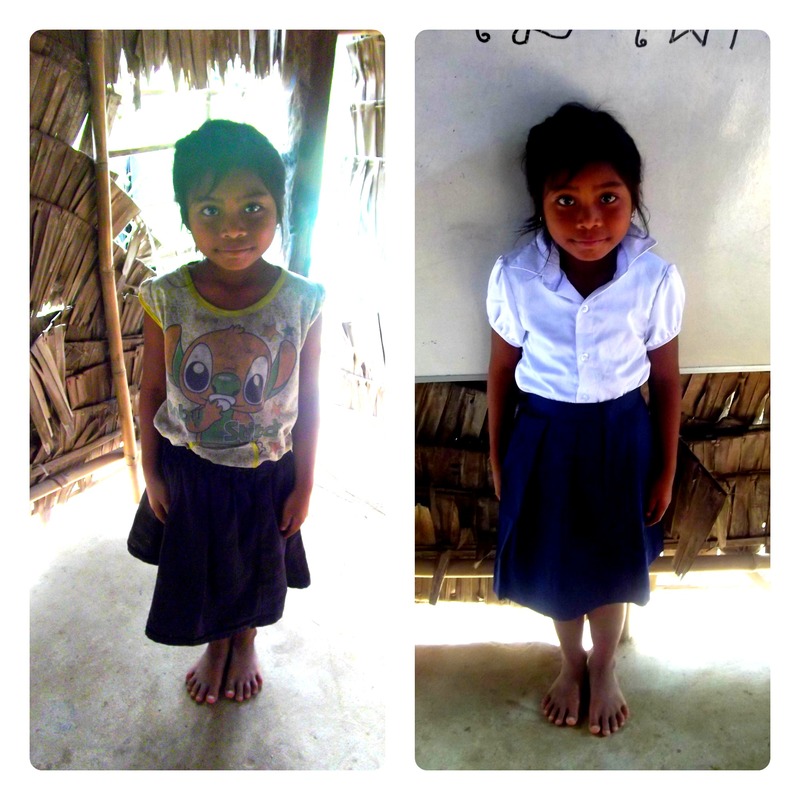 A before and after shot of one our kindergarten students in her new uniform. Every year as September rolls around staff and volunteers at Helping Hands are frantically busy finalizing, checking and double checking the brand new uniforms for our school students. The uniform program is essential to ensure Iqbal school students receive their compulsory government school education. At the local school (which Iqbal school pupils attend for half the day) students must wear uniforms in order to attend. With the local wage for a family in the village often being as low as $50 per month the cost of a new uniform for their children is not a priority and all too frequently acts as an impossible barrier for school enrollment. Just 34% of students attend lower secondary school in Cambodia, and barriers such as this are a key factor[i]. From left, teacher Sao Vanna, volunteer and fundraiser Aline, JWOC Project Manager Khoeurn, JWOC sewing student and Iqbal school teacher Sopheap all help out on delivery day. The process of supplying school uniforms is a long one. It begins, as every project must, with ensuring we have enough funds. The cost of living is noticeably increasing in Cambodia so every year we search out new quotes and prices from different tailors and sewing schools in the area. Maybe you are wondering why we don’t just go to the nearest clothing store and buy pre-made uniforms on mass. Such stores and pre-made uniforms aren’t available here. Tailoring is still a strong ‘cottage industry’ with every village hosting a few independent tailors. Iqbal school student and his new uniform! 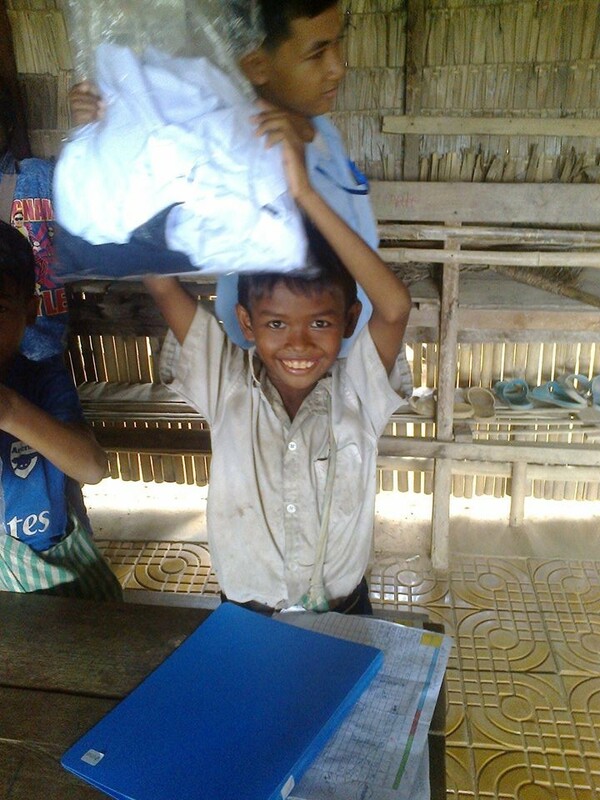 Since its inception the uniform program has been supported wholly by one volunteer, Aline Bersoulle, who sells Cambodian handicrafts in France and donates the proceeds to this worthy cause. We are very grateful for her support, and to everyone who buys the products making it possible! The for the past two years we have partnered with another charitable organization which runs a sewing training school in Siem Reap, Journeys Within Our Community (JWOC), and have found them to be an excellent partner. Measuring day at Iqbal school. In January the JWOC sewing students made the arduous journey out to Iqbal school to measure up each of our students. We have to be strict with our students and check off each name against the register, otherwise they bring siblings and neighbours along to get measured too! This is always a fun day with the sewing students making diligent notes for every child, and the children lining up excitedly, ready to be measured. Between January and September the sewing students are busy cutting, measuring, stitching and labeling every uniform. As summer rolls in we arrange a definite deadline for delivery. 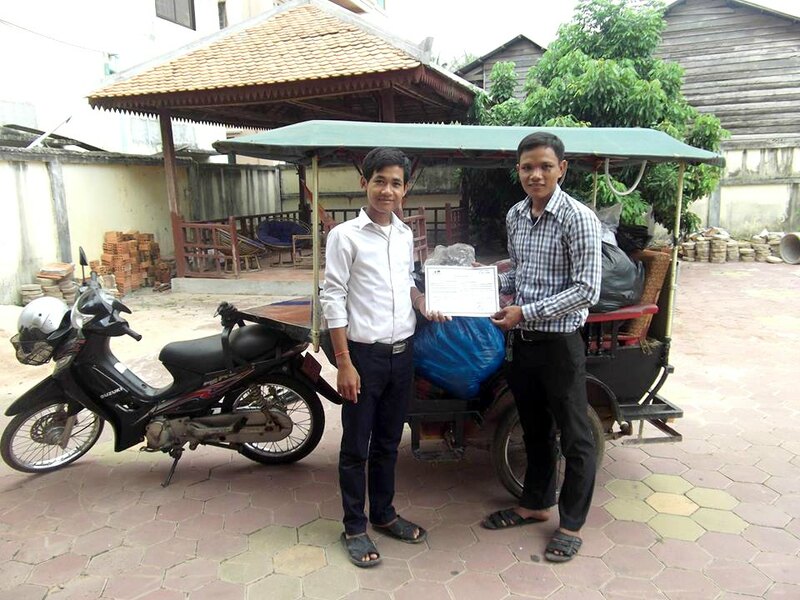 Helping Hands assistant Vith (left) and JWOC Program Manager Khoeurn on delivery day! On the first of September this year, Iqbal school students, JWOC tailors and our volunteer Aline Bersoulle congregated at Iqbal school. Class by class, name by name, each student came forward to receive their uniform. The resource room becomes an impromptu changing room and our students get a mini-makeover, changing out of their well-worn old clothes into bright, new outfits. Every kid beams with pride and enthusiasm, they can’t wait to show off their uniform at government school too! Students excitedly hold up their new uniforms. 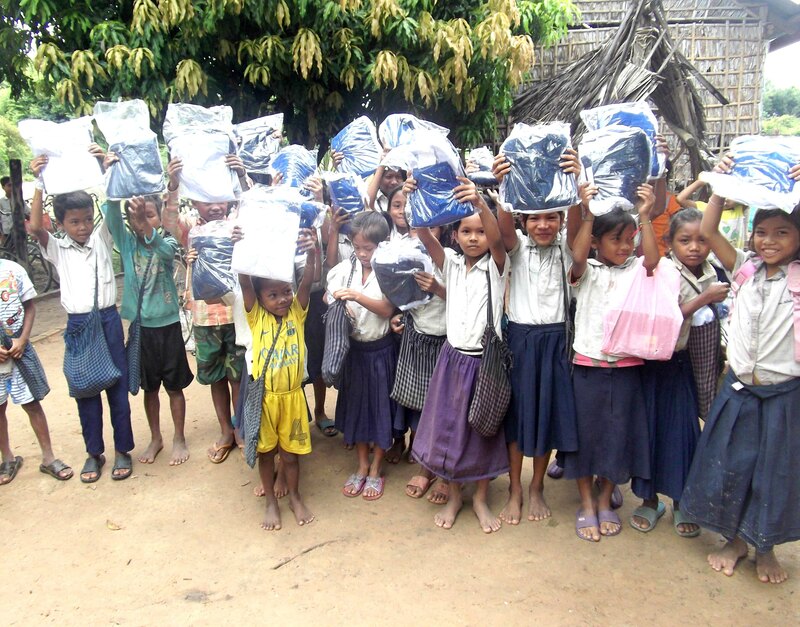 This year we supplied 242 students aged from 5-18 years old with two sets of tailor made uniforms. The cost per student for material and labour is approximately $20 each, bringing the total cost for uniforms in 2014 to $4108.76 The uniform supply program is one which Helping Hands is committed to continuing. 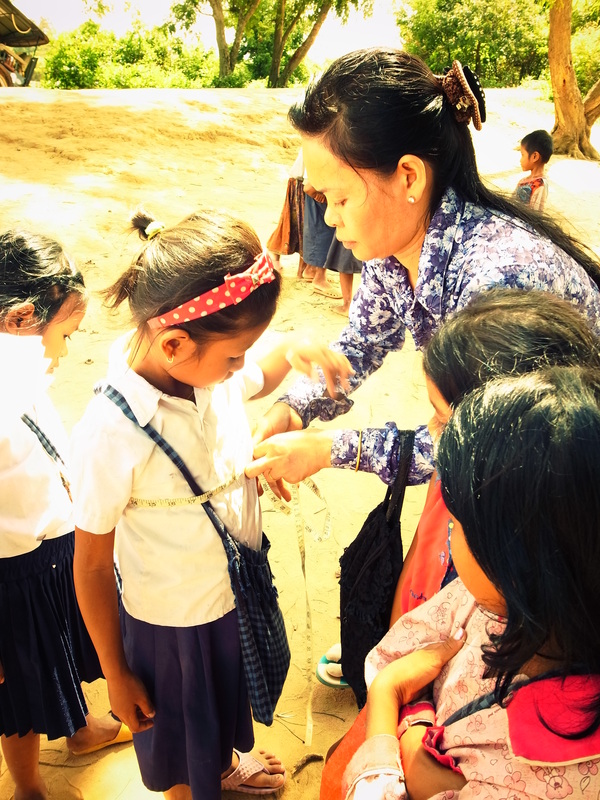 Not only does it support another charitable organisation, JWOC’s sewing school, but it guarantees more than 250 children in Prasat Chas village the chance to receive the education they deserve, and to feel great about themselves.